The Golden Eagle is sometimes used in Europe to hunt deer, they are so powerful. They can go into a stoop or dive at about 150 miles per hour. Golden Eagle pairs maintain territories of up to 60 square miles, and they mate for life. What does the Golden Eagle eat? Golden Eagles are carnivores. They eat rabbits, ground squirrels and just about any other animal including small deer and mountain goats! 30 years in the wild and up to 75 years in captivity. 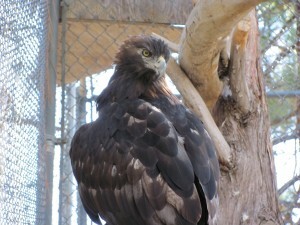 Our facility had a Golden Eagle named Old Man and he was at least 80 years old! That was as far back as the records would go. How many Golden Eagles can be born at a time? One to four eggs are laid each year and one to two may survive. Golden Eagles are found from Mexico through much of North America and as far north as Alaska. They are also found in Asia, Northern Africa and Europe. The Golden Eagle is sometimes used in Europe to hunt deer, they are so powerful. Golden Eagles can go into a stoop or dive at about 150 miles per hour. The Golden Eagles and all other indigenous birds of prey are protected by law. Golden Eagle pairs maintain territories of up to 60 square miles, and they mate for life. Native Americans called Golden Eagles “the war eagle” because they were symbols of power and authority. Lulubelle – Lulu came to the zoo in 1988. She was confiscated by Fish and Game and brought to our facility. Someone had pulled her from her nest as a baby in the wild and hand raised her. She was very imprinted and aggressive. She had been kept in a very small cage, only about 5 feet wide, and her wing span is 6 feet. Ares – has been with us since 1999 and arrived as an adult. He came from a rehabilitator who felt he could not be released since he was blind in his right eye. He was more than likely hit by a car while he was hunting. We have used Ares for many education programs since he is one of our calmer birds.